Wow, it’s the week for beautiful letters! I’m almost embarrassed to post this one, it’s so complimentary; but if there’s a bride on the fence out there, this may be helpful. When we started searching for photographers for our wedding, we thought it would be a long process. Every photographer we looked at all had the same boring poses and shots. We had the difficult task of deciding which ‘professional’ photographer we wanted to take boring pictures of our day. Then we stumbled upon Print’s Charming Photography. As soon as we saw the name we were intrigued, we laughed to ourselves at the cleverness of the name. 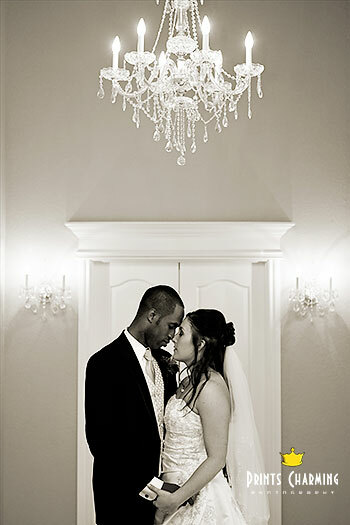 We looked throughout your website at the different wedding and engagements you had done. We were impressed with every single album on the website. We just knew we had to meet this amazing artist. When we met you for dinner, you were absolutely pleasant. You were just as excited about our wedding as we were. You made it seem like we were your main priority and our wedding was the most important wedding that you had to book. After that meeting we were completely sold. Throughout the entire process, you were never too busy to answer any of our dumb questions or make any adjustments for us. When we shot our engagement pictures, you didn’t seem rushed; you even suggested we take some extra pictures at the place where I proposed without us saying anything about it. It was that kind of thought and care that reassured us that we had made the right decision with Prints Charming. After we got the proofs back from the engagement session, I looked at Courtney and said, “He is officially our family photographer.” Your wife, Holly, was just as wonderful. She hung out with the ladies and blended well with the group. She got some wonderful pictures of the ladies being themselves. The way you two covered our wedding was unbelievable. All the things we may have missed or forgotten, you were there to remind us of our special day. Thank you guys for everything you did. You may not understand how much we truly appreciate all your hard work and kindness. You really are true professionals at your craft. Thank you, Ricky & Courtney, for being awesome customers and so much fun to work with! Your letter brought tears to our eyes… We’re so grateful to be in a position to serve and make an impact in relationships and families… We look forward to being your family photographers for years to come, and celebrating life together!